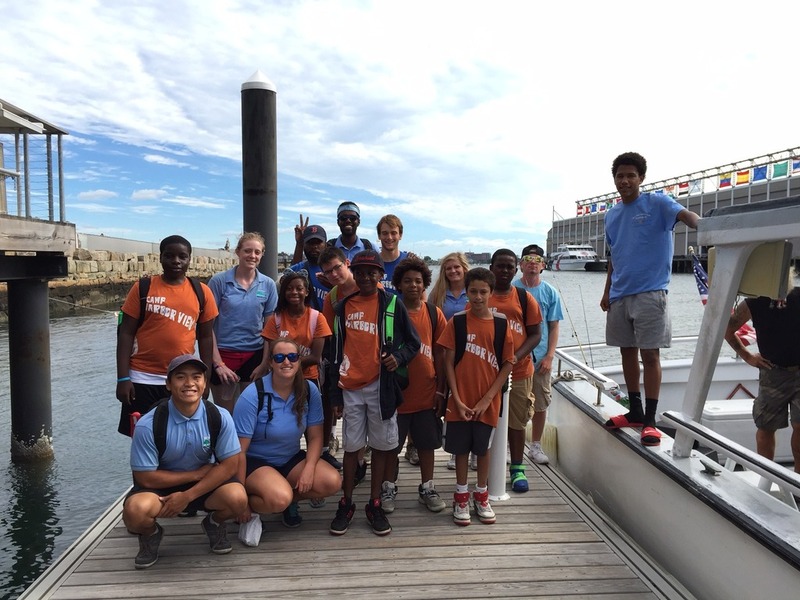 I first want to thank everyone at Save The Harbor for making this summer a memorable one. I have met so many new faces and to be honest, I'm glad that I did. I spent my last day at Carson on Friday and it made me sad that it was the last day of Save The Harbor. Over the last two months I have did things that I have never done before, thanks to the amazing people that I worked with this summer. Whether it was trying to do back flips on the beach, or interact with kids more than usual. Everyone this year was able to get me to do something new, and break out of my comfort zone, This year was about new relationships and new experiences. I have new friendships with people I would have never thought. And I've had a chance to experience new things based off of those friendships. It was an amazing summer with amazing people. I am saddened that the summer has to come to an end. 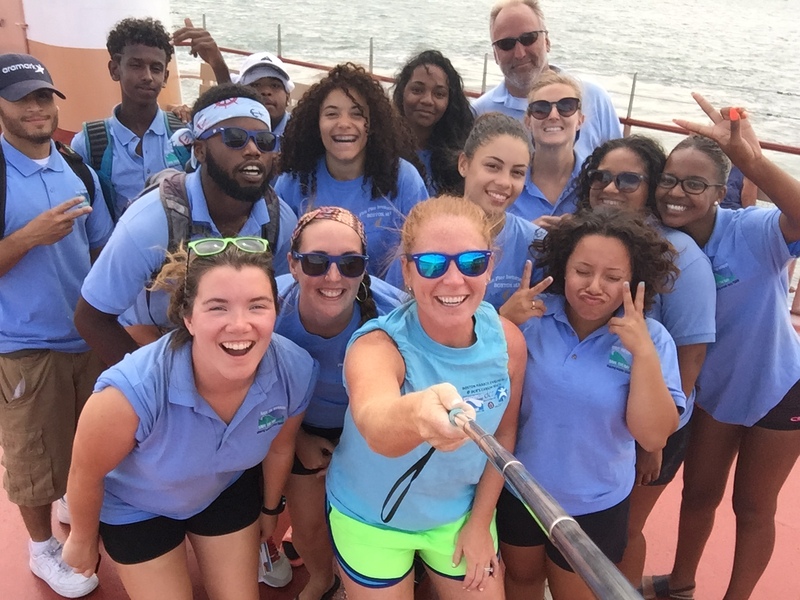 It was a great summer to work with Save The Harbor as is every summer. I wish everyone luck in their fall travels. Until next summer everyone, Preston. 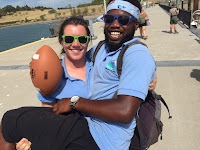 Hey guys, this was the last day working for Save the Harbor Save the Bay and Piers Park. I hoped coming back to Save the Harbor would be filled with surprises, and they succeeded at that. From the first day at Piers where none of us knew how to fillet a fish properly, to having some intense capture the flag games, to saying our final good byes. So much happened and it was crazy. I made so many new friends this summer. Amanda,Cristian, Ray, Sean, and I, the original Piers Park crew was basically a second family along with Piers Park staff Cris and Paula. There were so many laughs from the car rides to the station after work and Sean with his bananas everyday in the morning. We all had a special little role in keeping the kids together and helping the Piers Park staff with them. Amanda was "Mother Hen", Ray was the "Wanna be gymnast", Cristian would just be the chilled on and I was the person you used when you needed someone loud. We are all different in our own special ways but with how different we all are, this summer was the best for me and the kids. Couldn't have asked for a better Summer job. Well guys, the end has come. I cannot even begin to explain what an amazing summer I had. This was my first summer with Save the Harbor/Save the Bay. As you can see by reading all of my blog posts, I had a lot of new experiences that really brought me out of my comfort zone. I learned a lot not only about Save the Harbor, but also about myself and what I am capable of. I could not have asked for a better summer or for better people to share it with. One of the best parts of this job was knowing that I had a team of people supporting me at all times. It was tough to manage Carson Beach at times, for circumstances far out of my control, but I know that I had people behind me and helping me out at all times. I loved that I got to interact with so many different children, and so many different kinds of camps and groups. It was awesome seeing some faces over and over again during the summer, but just as fun working with groups only once or twice. Just knowing that camps and directors were setting aside time to come join us at the beach was a great feeling. We worked hard to advertise and reach out to the communities, so receiving such powerful feedback and high demand for activities felt really great. I spent my first day at Camp Harbor View on Monday. It was to be at another site other than Carson for a day. I met so many people. Some of them being close friends relatives, such as little brothers and sisters. Some of them whom I haven't seen since they were about six or seven. Seeing them now, they were about 13-15. And it brought back so many memories of them being so little and tiny. 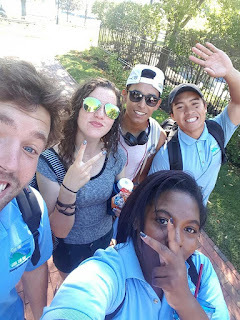 On top of the familiar faces, I had a chance to meet a bunch of new people as well. I had a chance to meet the fishing club as well. They are total pros when it comes to fishing and they are all so young. One kid even caught a Skate! While kids were fishing, I took Abel down to open up one of our crab traps. There were about six crabs in all. We put the crabs on the table so we could put the trap back into the water, and all of the crabs took off! They were running down to the other end of the table. If you were just looking on, it looked like we started a crab race. Here's a picture of Abel and I hold the proclaimed winners. Although it was my first time here at CHV, I had an amazing experience! From the new faces and old ones, to the epic crab race. I had a great day at CHV. Until next time CHV, keep on exploring, Preston. I can’t believe this is goodbye! This summer has been so great, I am extremely thankful for the opportunity that was giving to me. I can’t thank Patty and Bruce enough for this amazing experience. Thank you for everything that you have done for me. Thank you Mrs.Bridget and Amy for everything that you have done for me. I can’t believe this is over already. More than a job, it was a way to live like a kid again. Most of the things I got to do this year I never got the chance to do when I was growing up. I had a great experience with the kids. I enjoyed every single day working as a LHE. I gave my all so the kids could have an amazing summer and a great opportunity. 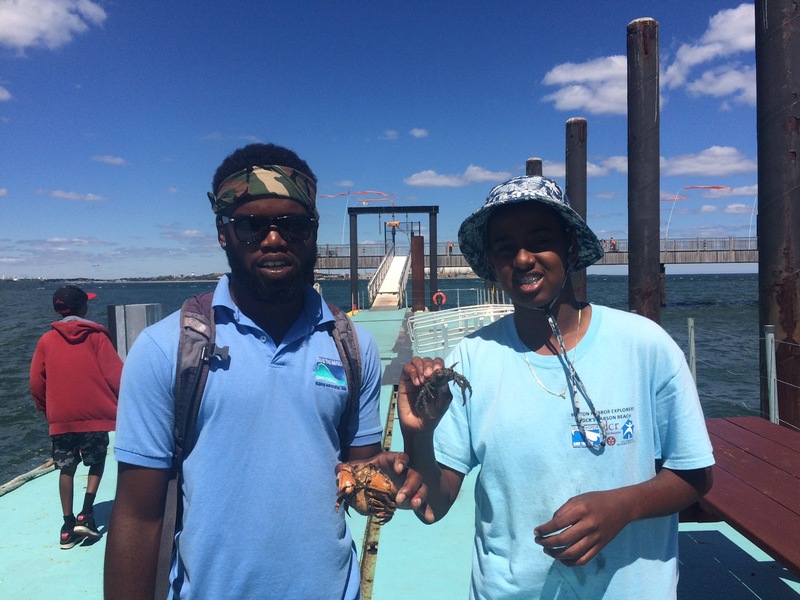 Not everyone growing up will have the opportunity to explore the harbor like the kids that were enrolled with save the harbor save the bay. I loved spending my summer with such an amazing people. 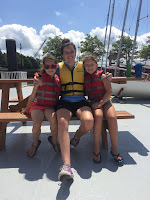 I was surrounded by wonderful kids that loved the harbor as much as I did. I loved what I did and everything I did I enjoyed it. I hope everyone else had an amazing summer. All of the SHE, the LHE and the JPA I hope you guys are all happy with this experience. I hope you all enjoyed the summer with the kids and hopefully got to do things you have never done before. Thank you all for everything. Going to Carson beach was fun today, because the kids wanted to make sand castles. Others wanted to play sports or even go out for a swim. The people walking along the beach joined us as well. They were wondering about the purposes of Save The Harbor Save The Bay. 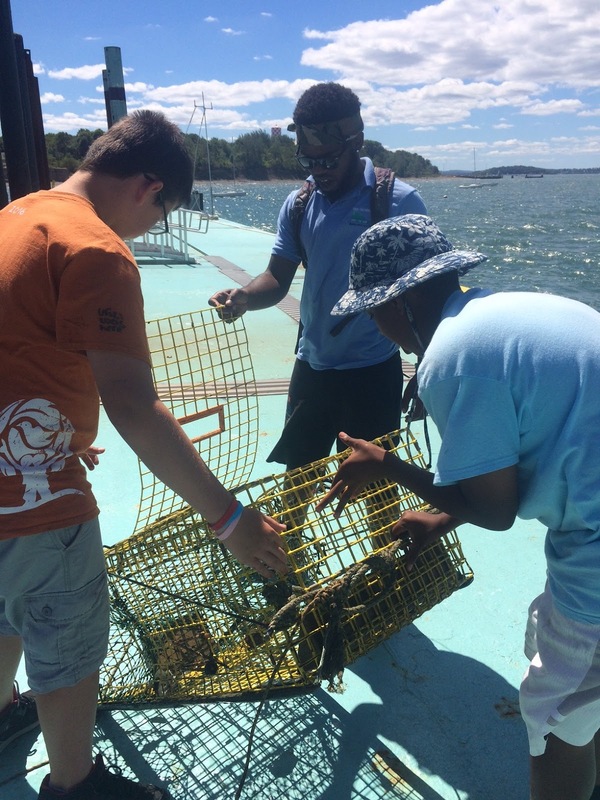 We said it is a non profit public interest harbor organization with a mission to restore and protect Boston Harbor. They supported the idea because they knew not only them but also the community would be able to enjoy it. Later we decided to fish around the beach. But no matter how many times we through it out into the ocean we never caught anything. Still the kids were having fun because it was something they did for the first time. We even did rock collecting along the beach-we would collect colorful rocks. Then found colors we usually don't see in Carson beach. We started to see jelly fish eggs again being push on to the beach. We were all wondering why there were eggs coming out the water. Everyone was enjoying the day not even worried about the hot weather. None of the kids wanted to leave, they would all say to each other I can't wait to come tomorrow. Greetings folks! 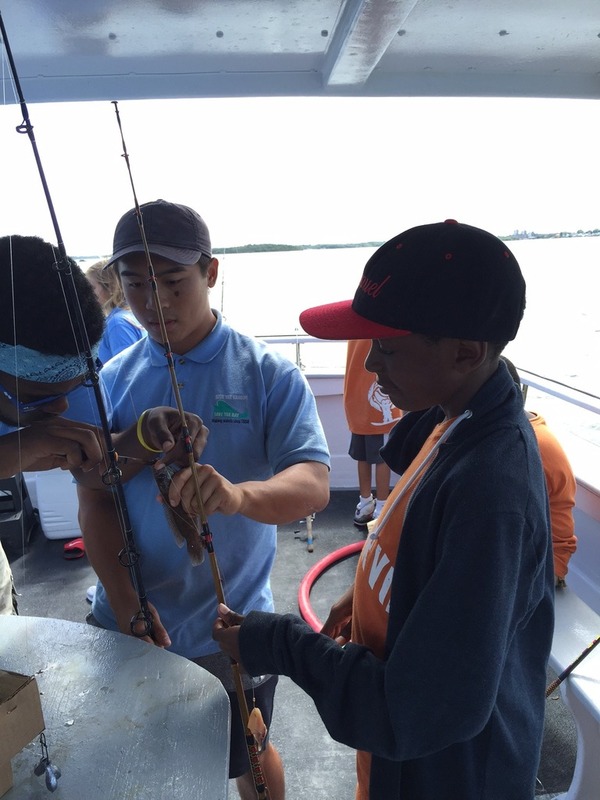 I had the amazing opportunity to attend the last fishing trip of the summer with Captain Charlie and the CHV team! During this trip we snagged a couple of small fish that notoriously ate our sea worms, which we released to only be hooked once again. We ended snagging a few black sea bass and Scup. Twice I had my line break due to a fish being too large! My excitement and frustration over losing such a fish got some of the fishing club kids on board to feel the same excitement when it happened to them. On our trip back, you could see some of the staff really enjoying their last few days of summer before the fall comes around by dancing to music on the boat and hanging off the edge of the ceiling on Captain Charlies boat! 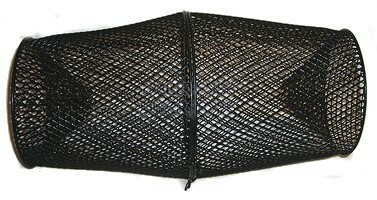 In this same week we had brought back from the office a second fish trap that looked even more superb than the first! After a few hours of letting it sit in the waters with some sliced up fish from our office's cooler, we caught a whopping number of 6 fish! We ended up using a filling a giant cooler with salt water so that we could create a mini-aquarium with the caught fish. That was definitely a highlight of this summer at Pier's Park! This week didn't end there, we ended up saving a grasshopper as well! On my kayak was Amalia and one of the twins (it was either Jopelin or Oliver). 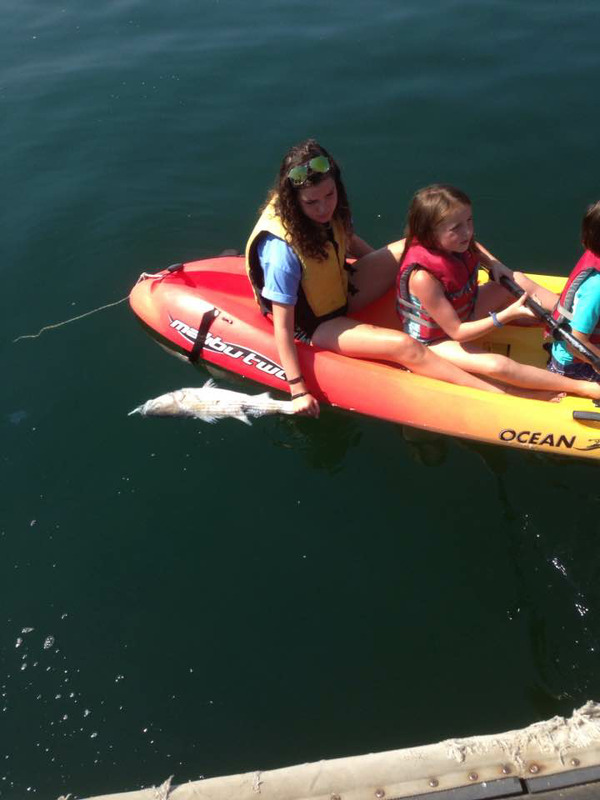 We were browsing around the waters doing one of the kids favorite activities, cleaning the harbor by picking up trash! We stumbled upon this grasshopper that looked like it was dead, so I lifted it out of the water with my paddle and it immediately jumped back into the water! I got the kids excited and told them that we could save the grasshopper and it was during our ride back onto the dock that the grasshopper took a ride one of the twins head! When we brought it back to the tent in a plastic bag (to make sure it wouldn't frantically jump off into the water) for snack time, all the other kids crowded around in amazement! It was shortly after that when Amalia wanted to release the little guy back into the grass. However, the grasshopper didn't hop off the moment we freed him, so one of the twins had the great idea of getting the grasshopper on his hat! In the next few photos you can see that the kids took turns having the grasshopper on their hats! That day, Amalia took home the grasshopper as a pet and that's when I figured that this could have been a Disney movie! It was during the luau that I saw Amalia again and heard from her and her mom that they built a small terrarium for the small grasshopper and fed it lettuce! It stories like these that feel unreal despite being there to witness it all happen! 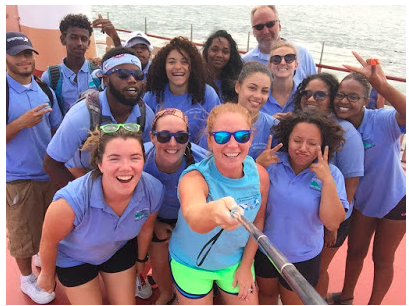 This was my very first summer working for Save The Harbor, and I can definitely say it was memorable one. 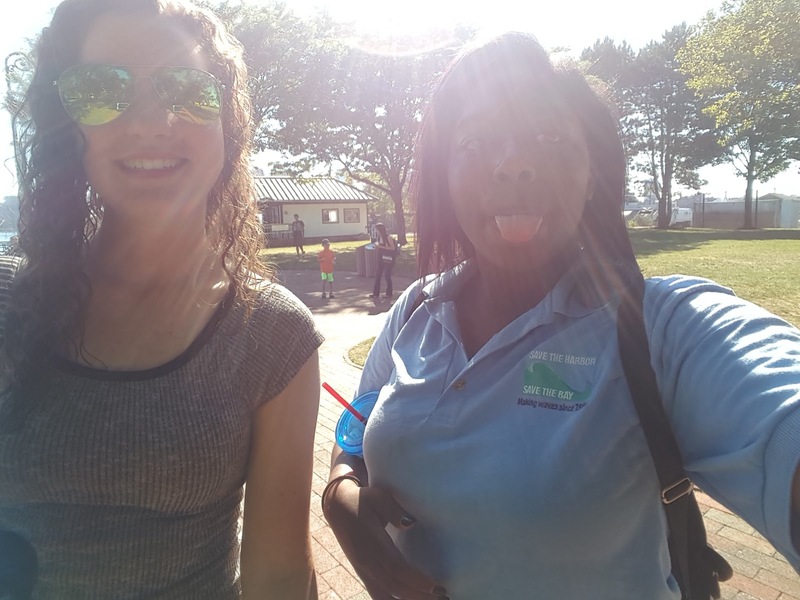 I started of the summer at Piers Park with Sean, Ray, Amanda and Ary and I remember us being completely lost the first day when we got there and then Raymond teaching us how to filet a fish and some other interesting facts. That same day I remember after lunch, we all went to the little park with the sprinklers and the kids making up this game where they'd chase us with water and try to get us all wet and they did a pretty good job of getting me, Amanda and Ray. I also remember the time we caught two star fish and a moon jelly and the kids were so excited to hold them and they'd ask all types of questions. After the first couple of days we all got the hang of things and I had a lot of fun working at Piers Park. After a couple of weeks at Piers Park, I got put on All Access and at first I thought I wasn't really going to like it because I was so used to my previous cite, but I actually ended up enjoying it very much. I loved going to the different islands; Spectacle then Georges, with about 500 new different kids each day. I got to see a lot of faces and even some of which I knew. 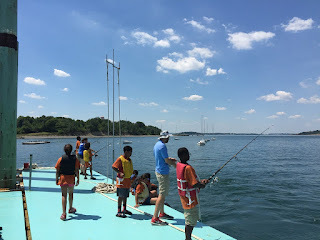 We mostly did fishing, and no, unfortunately we didn't catch much at either island, but we still got the experience of being outside and enjoying the harbor and we did catch a skate on the last day at Spectacle which was the best ending to the summer. This summer I tried so many new things, I took risks that I'd never see myself taking, I met a lot of great people, held some crabs, learned how to fish, and caught my very first fish ever during the Fishing Tournament! This was one of the best summers I've ever had and I'm glad I took on this opportunity! It was a very memorable summer for me and many other kids I'm sure. I can't believe it went by so fast! 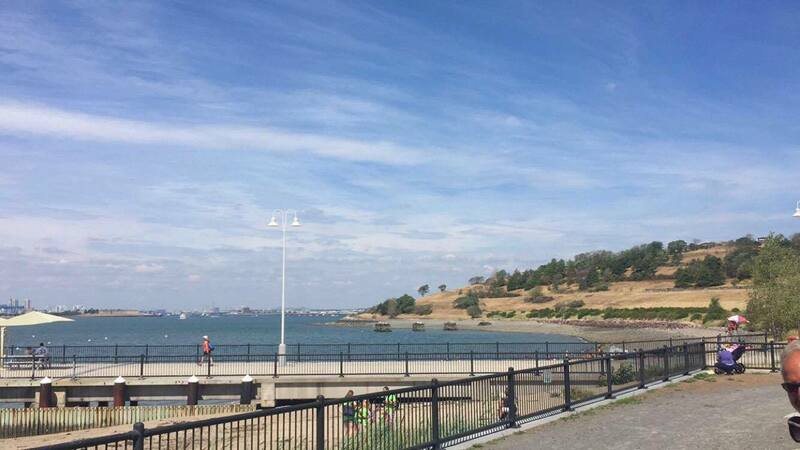 On Thursday, we all went to Spectacle Island for the last time this summer. On the boat ride there I took a couple of moments to just look out into the water and feel the nice cool breeze which I really had been enjoying this whole summer. I tried to take it in as much as I could because I knew summer was soon coming to an end. When we got to Spectacle, we had lunch and then did sports and fishing. I did fishing and it was an exciting day for all the kids that went fishing because after weeks of only catching a couple crabs at Spectacle, we finally got a fish! The little boy I was helping waited and waited so patiently until we began to see the rod bending and he yelled "I think I caught a fish! I think I caught one!!" Andrea then rushed over to help him and they both managed to bring the Skate out of the water. It made me really happy to see how amazed the kids were that they actually caught a fish after a long hot day. Afterwards we put it in the touch tank with the crabs for the kids to see and touch, and it was the best day ever for them. The last day at Spectacle and on all access was truly a memorable one. Something very exciting happened today at Piers Park. Well it was exciting but it was also gross. Unfortunately Sean was not here to witness this, but when we went down to the dock in the morning it was very low tide. I did not want to sit on the dock in the hot sun so I decided to take some kids on a kayak. We started going toward the rocks because I wanted to see if we could find anything interesting like starfish or something. We did not find starfish but as I was leaning over to look over for some starfish, I hear one of the kids say "Hey lets go over there near that fish!" I immediately was interested so I started paddling us over there when all of a sudden, a gross smell hits us. As we slowly paddle closer and closer to the fish we see the pretty big dead fish floating in the water. I thought "Hey we are not far from the dock, lets go bring it to show the rest of the kids and staff". I tried to pick it up out of the water but the second I pulled it out of water the grossest smell smacked me right in the face, so I kept it in the water and told the kids to paddle us towards the dock. First time we caught a fish! Today was unfortunately my last day at Piers Park. I had so much fun there this summer. I started out with Sean, Ray, Ary and Rusenny. I remember how we all came in on day 1 and none of us knew what we were doing. We showed up on a rainy day and did not know what to expect. That was the day we all learned how to filet a fish from Ray, who had filet a fish for the first time. Then, sadly, Rusenny switched to All Access, but we got Cristian. By the time Cristian came, Sean, Ray, Ary and I were already experts at Piers Park and he quickly learned the ropes. He joined my team for capture the flag, and helped us win a bunch a games. He was a good addition to the team. I worked with a lot of good people this summer, not only the Save the Harbor staff but the Piers Park staff also consisted of pretty amazing people. Each week we got new kids and each week we had a lot of fun. It was so nice to see how the kids loved the program so much. Zach would tell us how all the parents would tell him that their kids had a lot of fun, which meant we were doing a great job. There is this one girl who I do not think I can forget. Her name is Hannah. Hannah joined us for two different weeks, but in week one she ran into a problem. During lunch I was talking to Ray when I see Hannah standing in front of me crying. I asked her what was wrong and she said that she did not have any friends. That moment really broke my heart because I know that I've been in that awkward position. So I helped her talk to some people and Ray told two girls to play with her at the park. Then when she came back last week she had no problem fitting in. 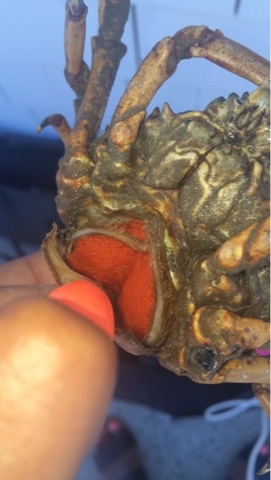 It was very interesting for me, to see how in the beginning of the summer we caught so many spider crabs, but towards the middle and end, we did not really see spider crabs, only rock crabs and green crabs. We also did not see any fish during the month of July, but August blessed us with so many fish that we caught. And even Eels! 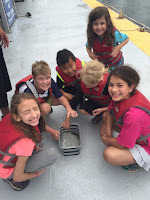 This week and last week you could even see the schools of little minnows swimming in the harbor. Celebrating an end to such an amazing summer! Much love guys<3 It's been real! Last week I was at Children's Museum for the first time and it was kinda different from all the other sites I've been to this summer. Mostly this summer I've been at Piers Park or All Access. In the morning when I got to the museum, there was a big tent and that's where we had the touch tank with the crabs and the Velcro fishing for the little kids to go "fake-fishing". On the dock in front of the museum is where we went fishing, actuallll fishing. 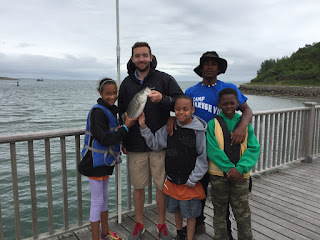 I was surprised at how many of the kids already knew what they were doing while fishing, many of them told me stories about going fishing with their dads, or grandpa or other family members and how they would catch all different types of fish. Then others were just learning for the first time how to fish and asked me all types of questions like "Are there actually fish here?" "Will I catch a shark?" "Why is this taking so long?" I had a lot of fun talking with different kids and also showing them the crabs and teaching them the difference between a girl crab and a boy crab, and how they lose their legs sometimes and many of them asked "do they pinch?" "Yes, yes they do indeed," I would say from experience. Although my time was short at Children's Museum, it was pretty memorable. final week and as well as the final days for Sean and Amanda If the title didn't hint that already but in those 2 days I've had a bunch of fun as well as how much my body aches from those 2 days alone. First Sean's final day the most eventful thing in that day was around the end where amanda,Sean, and Christian jumped off the dock with Sean giving the 10/10 dive into the water. Afterwards sean gave us a ride back to the station and we said our goodbyes to him. Now let's move onto Amanda's final day. first beginning in the morning at the dock of piers park in one peaceful morning comes a huge dead fish being dragged in by Amanda in a kayak smelling like it was piles of manure but nonetheless we decided to cut parts of it off for the crab traps and fish traps, here's a pic of amanda pulling the thing in. After cutting and almost puking a few thousand times, the traps were ready and by the end of the day we had crabs crawling on crabs crawling on more crabs as the traps were full, but after all of us smelling like the deceased fish we all said our goodbyes to amanda and while a few stayed for the luau I left to return to my home to shred through 6 bars of soap to get rid of the smell. Not only was last Thursday an excited day for All Access staffs but also for the kids. 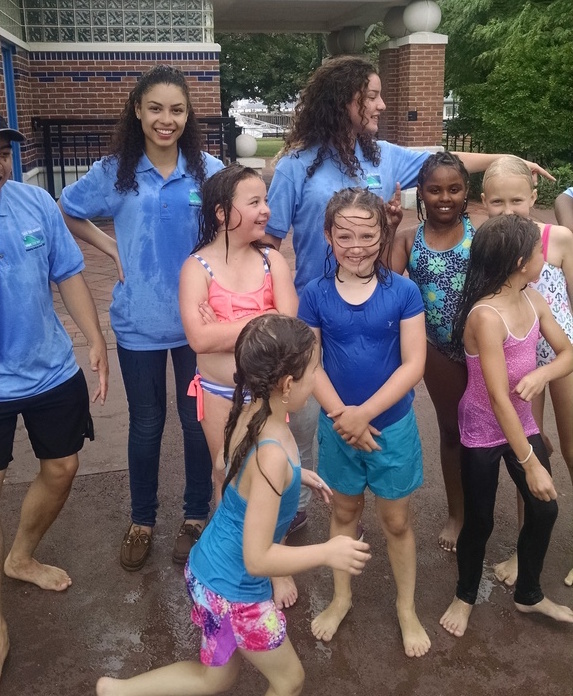 It was the last day that a lot of summer camps came out with us which was a surprise because I was not expecting that many groups to come out since a lot of the summer camps wrapped up their summer a little early. As kids and staffs waited at the Pavillion to welcome our Mayor, we had a few activities going on such as fishing, fish printing, crabbing and coloring. We also had a couple of staffs do a beautiful fish print on a white T-Shirt for our Mayor. 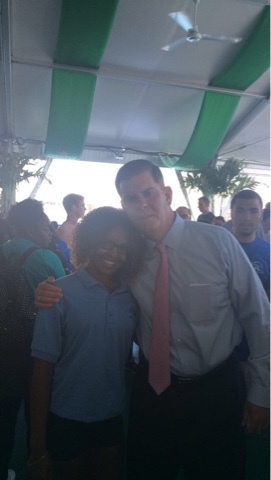 As all of the kids gathered in the Pavillion to welcome the Mayor, they all screamed "Good morning Mr. Mayor". Thursday morning, everyone tried getting a selfie with the Mayor and I was lucky to have a picture taken with him as he congratulated me as the fishing tournament winner. I had no idea of what was going on when my boss Bruce Berman called me up next to the Mayor in which the Mayor handed me a brand new rod. It was a great morning having the Mayor there to start off our morning. 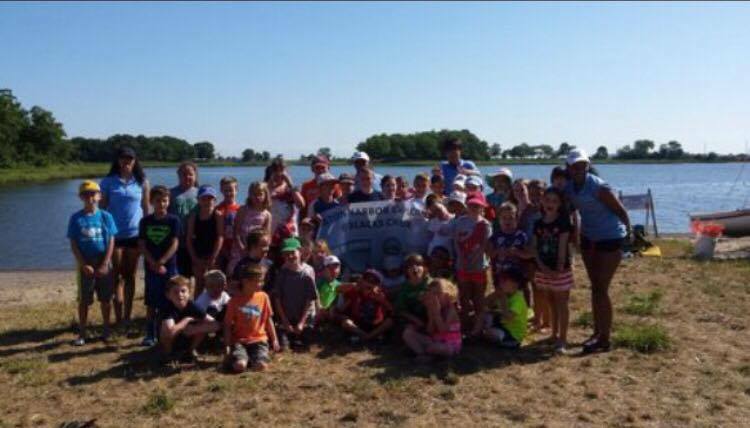 All of the kids were excited and had a great morning before headed out to Spectacle Island. 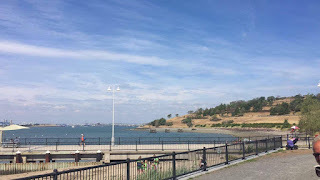 As All Access Boston Harbor is wrapping up the summer this week, it gave families and friends the opportunity to come out to Spectacle island. On Tuesday we had a lot of families that came out with us. Although the attendance went down, it was still fun. As always, I was fishing with a few groups of families where kids were fighting over rods. When I made the kids understand that there were not enough fishing rods for everyone, fishing got a lot better even though we did not catch anything. Usually I cast out a fishing rod and leave it out there to try to catch something to show the kids. This time just when I thought I had a skate on the line, It turned out to be a huge spider crab. 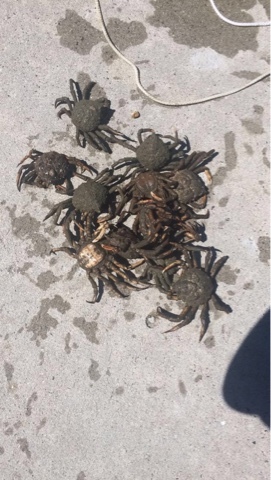 The family that was there at that time also helped me pull up the crab trap in which all that was inside were 10 spider crabs. Throughout this summer, I was waiting to catch some pregnant spider crabs to show kids and families what a pregnant crab looks like. Luckily, four of those crabs were pregnant so I was able to show the kids and families and they were all amazed. That was the highest number of spider crabs we had caught all at once in a trap. I cant wait to see what the last day of the program will be like. Well it's unfortunately that time again, the summer is coming to an end. Since the first day of work three years ago, I knew this was going to be a special place to work. I thought I came into this job with a decent amount of knowledge of the harbor, but I could not have imagined how much I have learned in the past three years. From simple things like how to correctly tie a fishing line, to life lessons like how to handle a bullying situation between two kids, I have experienced a multitude of situations that have made me the person I am today. By far my favorite site this summer was Camp Harbor View. Aside from soaking up the sun and playing frisbee on our down time, the personalities of the kids and counsellors at Camp Harbor View were unmatched. Everyone arrived to the boat in the morning with bright smiles on their faces, ready for whatever exciting events were to unfold over the course of the day. For the first time in three years, I was regularly a part of catching stripers and skates on site. I was just as excited as the kids when we would reel up one of these fascinating creatures, and for some of the kids it was their first time seeing an animal come out of the ocean! Out of all of the Better Beaches events I attended this summer, my favorite was Aquapalooza. 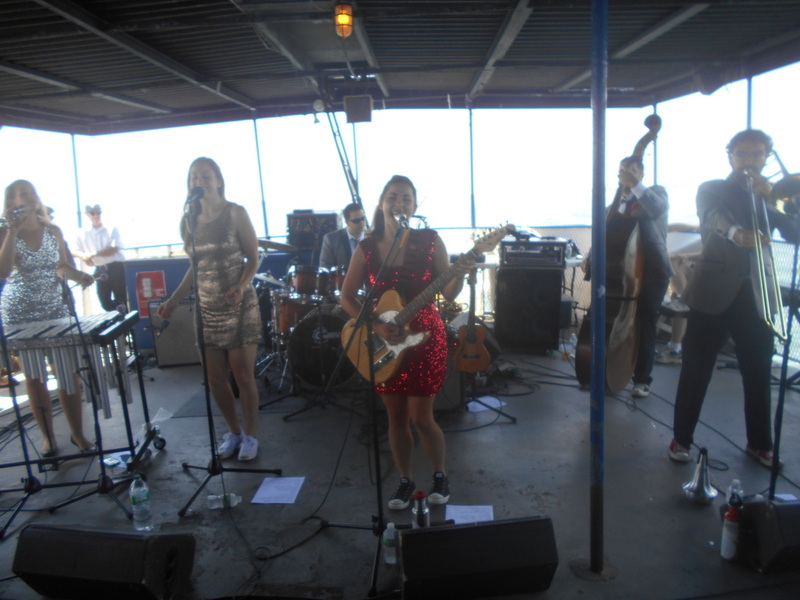 This event truly showed me that music can be the common denominator in bringing a bunch of strangers together in a room (or in this case, on a boat). Bridget, Emily and I were by far the youngest ones on the boat, but age was truly just a number on this cruise. I was amazed to see some of these people in there 50's, 60's, and 70's grooving to the rhythm of the music the entire cruise! while we were regularly taking breaks to catch our breath. That was one of the funnest days I experienced all summer, from the music to the personalities, all around just an amazing day. I would highly suggest this event to all of our 21+ readers, because it is an awesome experience. When I return to school in the fall, I will be returning with new friends, and tons of new memories. Every single summer my friend group grows, as well as my life experiences. I'm constantly learning new things from the people I meet through Save the Harbor, and I wouldn't want to have it any other way. 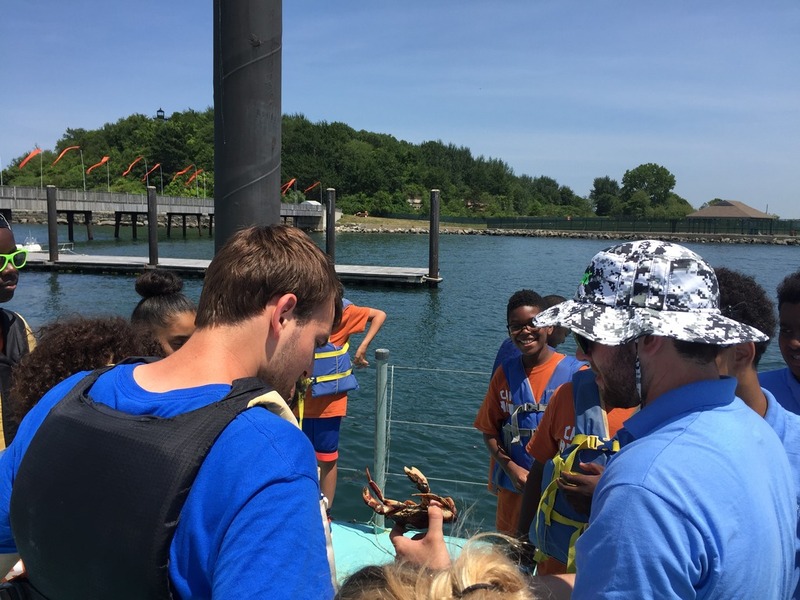 I will be graduating in the spring with a degree in Marine Biology, and I truly believe that my time here at Save the Harbor has helped me make it this far. I'm excited for what the rest of the year has in store for me, and hopefully I will be back to make more memories in the summer. As the summer winds down, I'm beginning to reflect more and more on the summer. Out of all the sites I visited this summer, I would have to say Camp Harbor View has been my favorite. I think it's awesome that Save the Harbor is allowed to play even a small role in the daily activities that go on out on Long Island. No matter how long I've been working here, it still puts a smile on my face when I see a child's face light up when he or she sees a fishing rod and realises they are going to get to use it. Camp Harbor View has proven to be the best site for fishing, at least in my experience, over the past few years. I have been in attendance for two stripers and three or four skates this summer, which is by far the most that I have ever seen caught at one site. 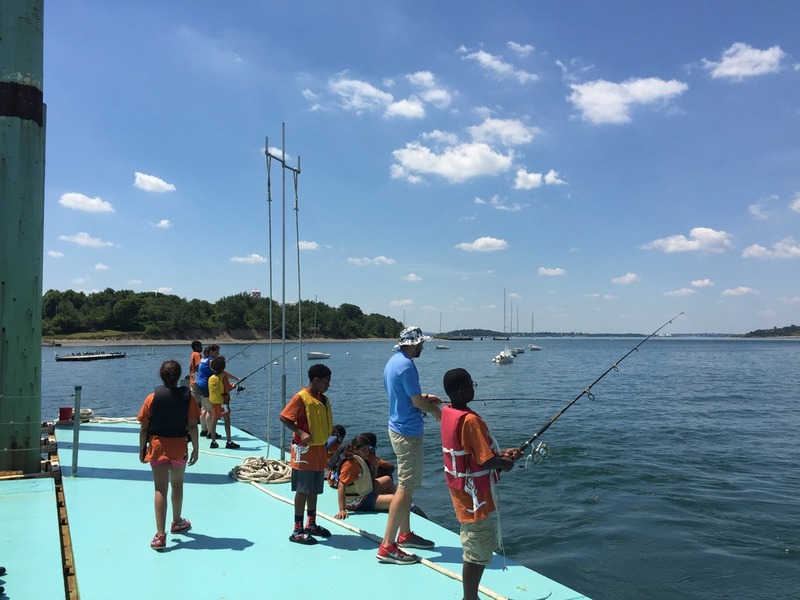 I'm sure I have the same surprised look on my face as the kids when we reel up a striper, because they have seemed to elude me throughout my time here with Save the Harbor. One thing we don't have any trouble catching at CHV is rock crabs. The trap we have at the end of the dock is always filled with crabs when we pull it up, and every time is a new adventure.